Multiple superyacht captains, crew agencies and management are now using video interviewing to find the most suitable crew quickly and easily, irrelevant of where in the world they are. As the only superyacht specific supplier of video interviewing, TUV Consulting are uniquely placed to advise and provide captains, crew agents and management companies with low cost, low bandwidth solutions to make recruiting new crew hassle free. Prices are very reasonable with 15 videos costing just €150. Plus the sharable, recorded interviews mean that team decisions can be made quickly by sharing candidate videos with senior crew, management companies and any other decision makers. Any new technology can be a little scary at first, and finding the time in a busy schedule to learn how to use it can be almost impossible. 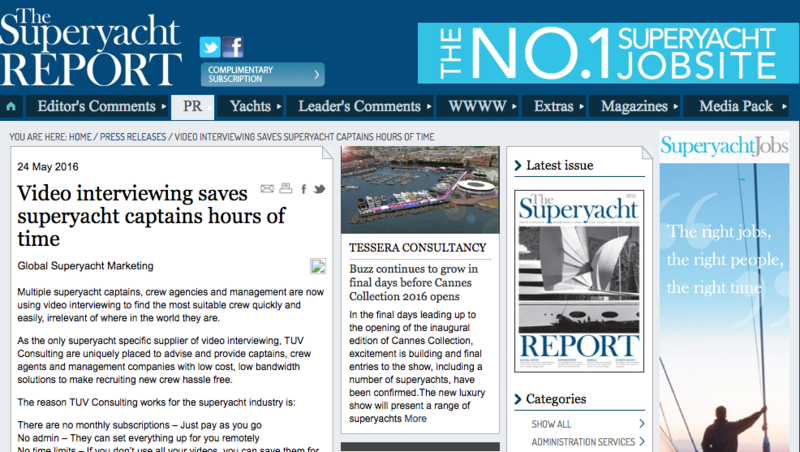 TUV Consulting have first hand experience working on board numerous superyachts and understand just how busy life at sea can be, so they provide full support for their customers. They can visit your yacht or office in person and set everything up for you in a matter of minutes, or are just as happy to set everything up remotely. You can choose the interview questions or they will pick three for you and then before you know it, you will receive videos of candidates answering your specific questions. It’s a fact that most of us decide if we like someone or not within two minutes of meeting them. Imagine being able to make that decision by watching a quick video and saving yourself the time it usually takes to sit through a face to face interview with someone who is just not suitable for the job!